A better way for broadcasters to successfully engage their audiences through a fusion of social networks, gaming and TV content. A powerful Player vs. Player game based on TV content that can be played among users, generating more engagement for broadcasters. 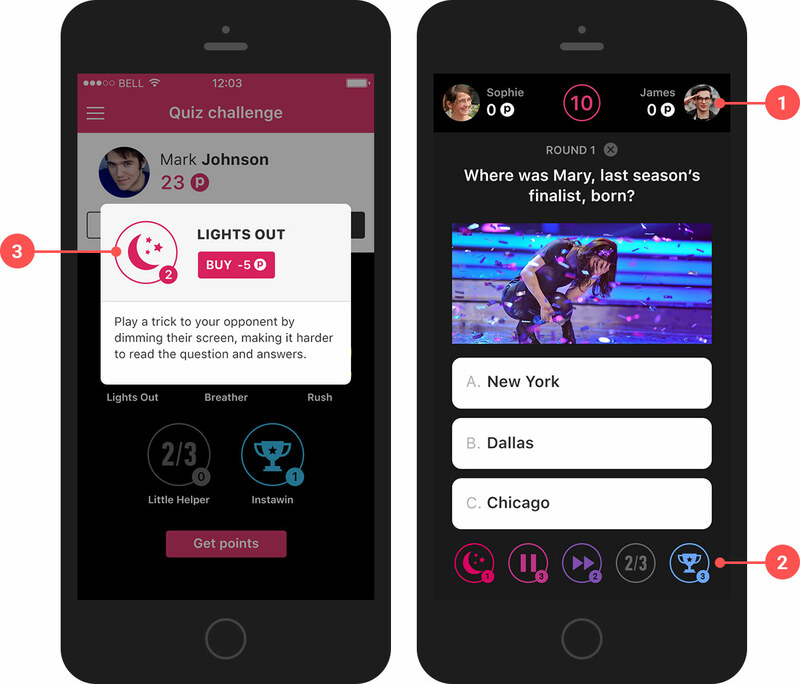 You can challenge your friends to play with you a live quiz game, have fun and win points that can be transformed in other benefits later on. Players can benefit of different advantages during the game by activating their in-game power-ups to help them win the round. Gather points to use them for unlocking special content or spend them within the app on power-ups to have better wining chances. WANT TO SEE TELLY IN ACTION? Producers have the possibility to gather the audiences’ feedback about the shows, in real-time, through live polls, votes and quizzes. 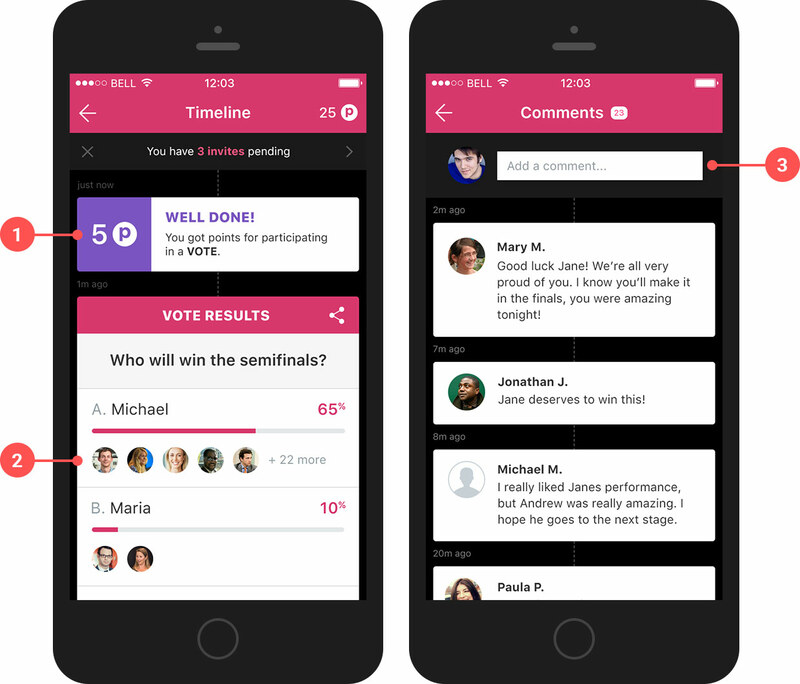 Polls, votes and quizzes can be triggered in real-time to gather the users' feedback about the show and make the audiences to interact with the show. Users will receive a live result about the topic they interact with and have information about how others expressed their opinion. Live comments bring in additional engagement flavor and make the users spend more time within the app and create a fuss around the subject. Only one 2nd screen application that can rule all your shows, with several real-time engagement methods which makes your audiences interact with your shows and have access to dedicated content for each show. Cost effective and easy to customize mobile application by adding new shows in a matter of minutes and see the changes in real-time in the app. Broadcasters can promote their content such as articles and videos. The content is distributed through tiles and each tile is represented by an article or video. 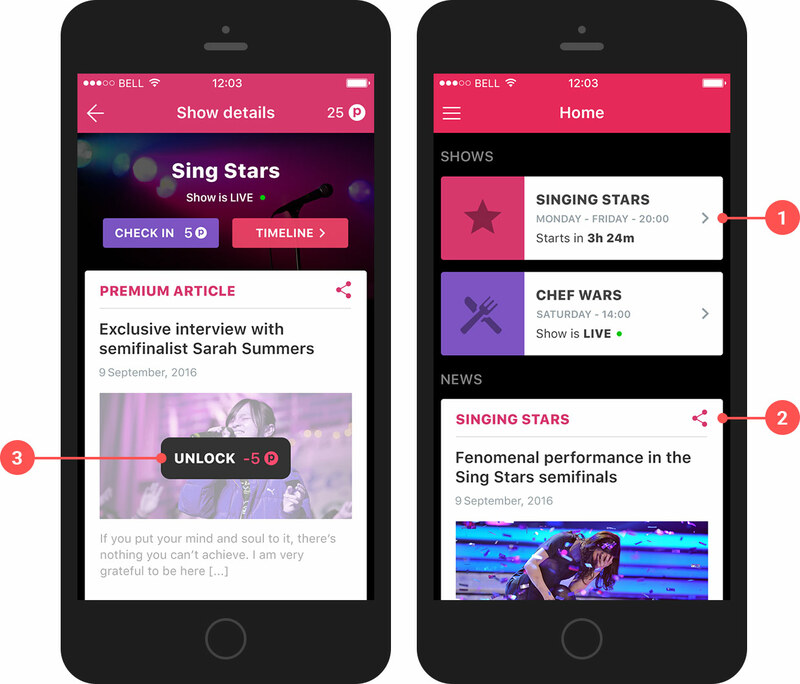 Premium content is injected through the content feed & can be unlocked by the users. An unlocked item is added on the user's account, under the premium content. 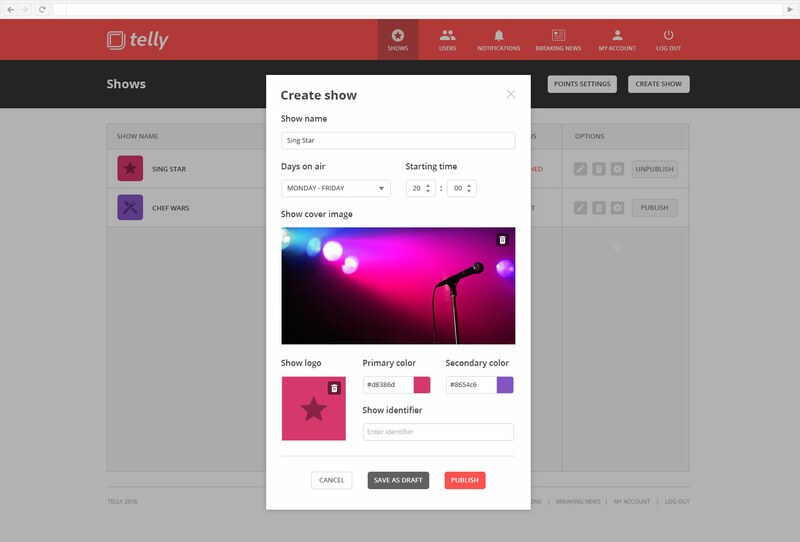 Telly provides a robust back-end, serviced by a dashboard, which makes the app customization and management easy to handle. Add as many shows as you'll need in couple of minutes without the need of any development knowledge or app re-deployment. Customize each show by keeping the brand's identity without the need of additional custom development services. Manage the entire content of the app through an easy to use dashboard. Trigger live polls, votes, etc. and gather the results in real-time and moderate inappropriate comments. Have access to edition's statistics about how many users participated in live interactions. No need for any extra development services and be ready to have the solution live in matter of weeks. Having only one application, that has all the desired shows within it, is easier to manage. The life span of the app is no longer closely related with one show.